If you were a kid in the 90s, you'll probably remember the Neo Geo as the games console that brought true arcade gaming into the living rooms of the very wealthy. The pricey system was a commercial flop, but for the fortunate few who managed to convince mummy and daddy to buy one, the Neo Geo attains cult-classic status for delivering some of the best fighting and shooter games around at the time. SNK, the original makers of the Neo Geo hardware, has teamed up with Blaze who has already launched retro games consoles like the Megadrive Handheld and Atari Flashback, to launch the Neo Geo X Handheld. 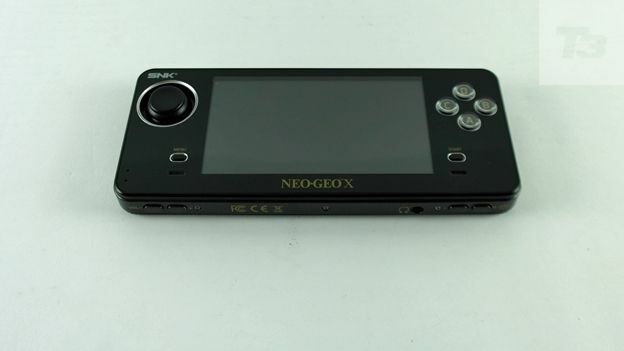 T3 was fortunate enough to get hands on with the very limited edition Neo Geo X Gold version of the portable games console which, along with the pocket-friendly console, includes a working Neo Geo control stick and a docking station modeled on the original. We grabbed some time testing the handheld out and will be checking out the TV compatibility for our full review. Initial images of the Neo Geo X suggested it could look a lot like the iPhone 5 and while that was by no means the case when we opened the box, it has clearly taken inspiration from the Apple smartphone in terms of the rectangular body and curved edges. Around the same size as the Sony PSP, the X features a rubbery back to provide decent grip and hosts a 4.3-inch 16:9 ratio LCD screen that delivers a not so amazing 480x720 resolution but is decent enough for the type of gaming you'll be playing on it. In terms of buttons there's the A/B/C/D buttons in a diamond formation on the right side of the device with the Start button and one stereo speaker just below while on the other side you'll find the 8-direction D-pad which makes a clicky noise just like the original Arcade Stick did plus the menu button and another speaker. On the top edge you'll find L1/L2 and R1/R2 shoulder buttons and in between those connection ports for micro HDMI, AV and USB port which allows you to charge it inside the docking station. On the bottom edge of the device you'll find the volume controls, a 3.5mm headphone jack and a dial to adjust the screen brightness. Lastly, there's the on switch and a game card slot on the side which is essentially a SD card slot. Those fortunate enough to get a Gold version will get a docking station modeled on the original Neo Geo console where you can charge the handheld and connect it to a TV via micro HDMI, AV out and USB ports. Disappointingly the handheld doesn't sit in the cartridge slot as we hoped but locks into place inside the shell. On the docking station, you'll find two USB ports which means you can connect not one but two Arcade stick controllers for two player gaming when running through a TV. There are 20 built-in games which provide decent variety with classic beat-em-up King of Fighters and football game Super Sidekicks on board but there is also support for additional games via game cards, which are essentially SD cards, with a copy of Ninja Masters included in the box. We talked to the boffins at Blaze and they have plans to roll out more game cards in the future but with no details on pricing. When you turn it on, the menu is basic to say the least but we expected nothing else. You can simply scroll through the pre-installed titles and available game cards, and then hit A to boot a game up. There were a few incidents where loading did stall but generally games were loaded and up and running in seconds. Controls are nicely executed for the type of games you can play on the Neo Geo X particularly the D-pad which reproduces the arcade-type control nicely. We did however have an issue with the decision to assign pause and ratio change (from 4:3 to 16:9) features to the shoulder buttons which can occasionally get in the way during the frantic-button bashing. We tested out Art of Fighting, Metal Slug, Super Sidekicks and Baseball Stars II and found all played well on the system and showed no issues in terms of performance or compatibility with the control system. The Neo Geo X Handheld is certainly not a device that is aimed at taking a swipe at the Sony PS Vita or the Nintendo 3DS but hopes to tap into lovers of the console and the games that didn't have the money to own one first time around. If you're lucky enough to get your hands on the Gold edition, the AES Arcade stick and docking station add to its overall retro charm, but if you only manage to get the handheld on its own it still feels like a big investment in a system that lets you play games that feasibly can be accessed through emulators, apps and online gaming services like PSN and XBLA. Hopefully SNK and Blaze will make more games available which could decide whether this is a worthy investment, but on the hardware front we can't really fault what is a great place to live out your 90's gaming once again. Stay tuned for a full review.